Setting up an IP address range in Klipfolio – How can we help you today? An IP address is a unique address for a device on the network that uses the IP standard. You can restrict user access to Klipfolio by specifying a single IP address or an IP address range. To set up an IP address range, you need administrative access. Open Klipfolio and click the Account link. Select the Security link located in the left pane. In the section, IP Range Restrictions, click the Restrict Access with IP Ranges link. 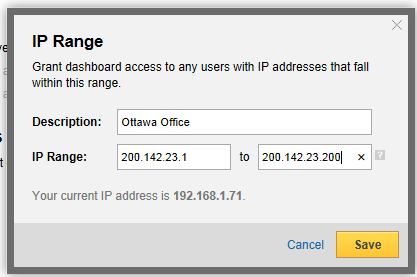 At the IP Range field, type in an IP address range to allow a specific set of users access to your Dashboard account. You cannot use wild characters when specifying an IP address range. To set up a single IP address, you need administrative access. From the Dashboard, click the Account link. At the IP Range field, type in a single IP address to allow only one user access to your Dashboard account. You can leave the to field empty. In a scenario where setting up an IP address range restricts all access to an account, immediately contact our support team at support@klipfolio.com.